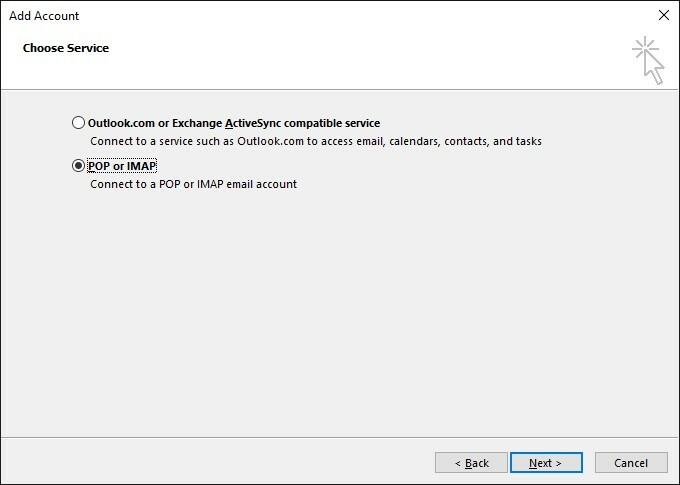 This guide is for setting up IMAP in Outlook 2016 to access your mail, IMAP is recommended if you are checking mail on multiple devices and wish to store your mail on the server. 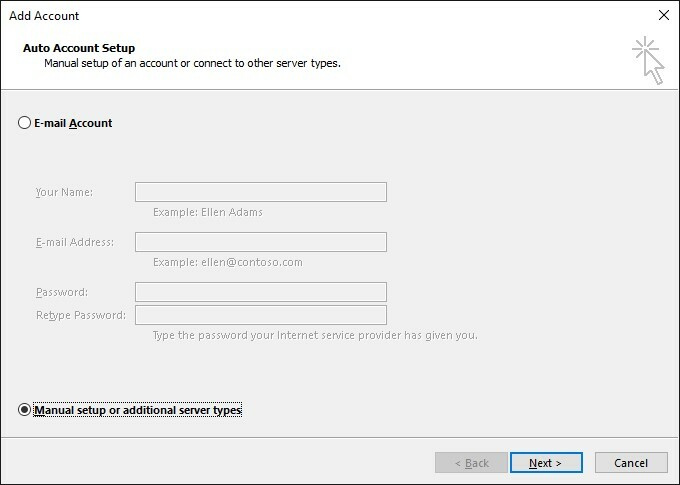 Select the checkbox Manual setup or additional server types. Click Next. Select the option POP or IMAP and hit Next. The email address that you are setting up the IMAP account for. 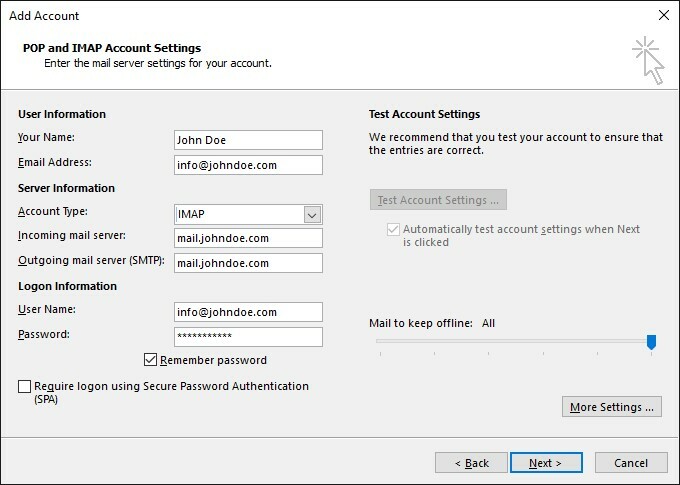 Incoming mail server: Enter mail.yourdomainname.com, for example if your domain name is johndoe.com please enter mail.johndoe.com. 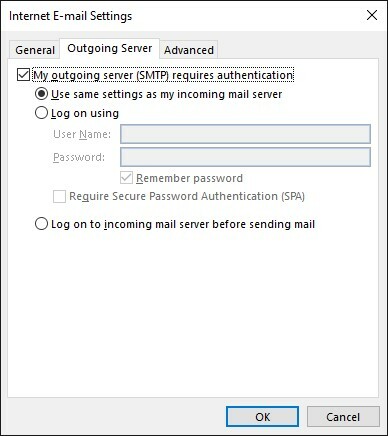 Outgoing mail server: Enter mail.yourdomainname.com, for example if your domain name is johndoe.com please enter mail.johndoe.com. 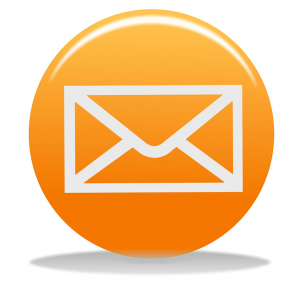 User Name: Specify your full email address. Example: info@johndoe.com. 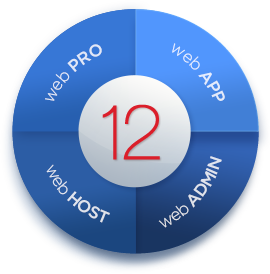 Password: This will be the password that you set when creating the mail account in Plesk, it is the password that you use to login to RoundCube webmail. 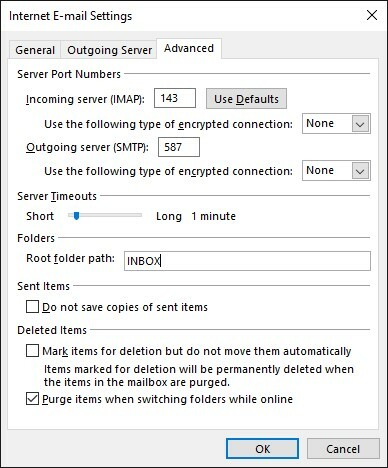 Open the Advanced tab and enter 587 as Outgoing Server (SMTP) port and INBOX as the Root folder path. Click OK and Click Next to complete the setup. 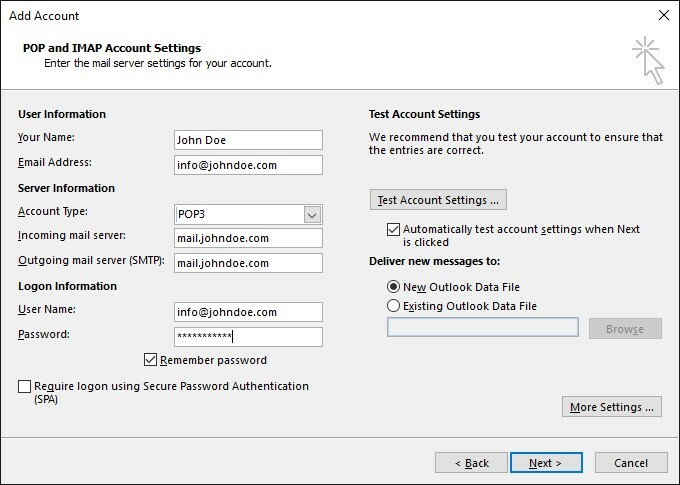 This guide is for setting up POP in Outlook 2016, POP is recommended if you will be checking mail on one device and wish to store copies of mail on the device and not on server. The email address that you are setting up the POP account for. 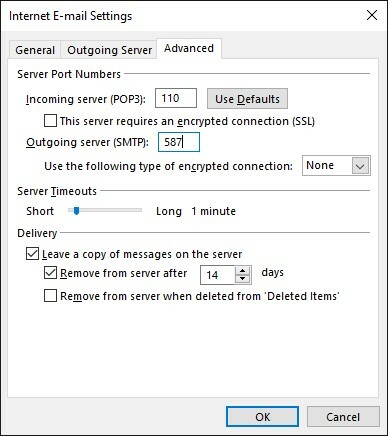 Open the Advanced tab and enter 587 as Outgoing Server (SMTP) port. Click OK and Click Next to complete the setup. If you have directories in a site that only authorised users should see, restrict access to these directories with password protection. Go to the Websites & Domains tab and find the site’s domain name. In the Directory name box, specify the path to the directory that you want to protect with a password. This can be any directory existing in the site, for example: /private. 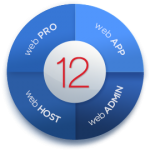 If the directory that you would like to protect has not yet been created, specify the path and the directory name – Plesk will create it for you. If you are using a Linux-based account, you can also protect your CGI scripts stored in the cgi-bin directory. To do this, leave ‘/’ in theDirectory name box and select the cgi-bin checkbox. In the Title of the protected area box, type a resource description or a welcoming message that your users will see when they visit the protected area. Click OK. The directory you specified will be protected. To add authorised users, click Add User. Specify the username and password that will be used for accessing the protected area. The password should be from 5 to 14 symbols in length. Click OK.
Click on the name of the directory you need. Click the Add User icon. Specify the username and password that will be used for accessing the protected area. The password should be from 5 to 14 symbols in length. Click on the name of the directory you need. A list of authorised users will open. Click on the user’s name. Specify the new password and re-type it for confirmation. Select a checkbox corresponding to the user’s name. Click Remove. Confirm the operation and click OK. Select a checkbox corresponding to the name of the directory from which you want to remove protection. Click Remove Protection. The protection will be removed and the contents of the directory will be accessible to the public without restrictions. Reducing SPAM and protecting your email reputation is an ongoing project, your job is never done. There are however some tricks, and this is one of them. Spammers send emails to non-existent email addresses all the time. It’s part of their strategy. Here’s why. Let’s imagine you have setup a mailbox for your domain, john.doe@yoursite.co.uk. All email sent to john.doe@yoursite.co.uk will arrive at your inbox. So far, so good. So… What happens to emails sent to test@yoursite.co.uk? This is determined in your Mail Settings in the Plesk panel. There’s three options. 1) Catch-all method: If you have setup a catchall to john.doe@yoursite.co.uk, then emails sent to test@yoursite.co.uk (and in fact any email for anyone@yoursite.co.uk) will arrive in your inbox – it won’t take long to fill this mailbox with this catchall email spam. 2) Forward to address method: To prevent john.doe@yoursite.co.uk filling up with spam, you may choose to send all your spam emails to an old Gmail account, john.doe@gmail.com. Great, no spam for your john.doe@yoursite.co.uk mailbox! Well, not so great i’m afraid. This is potentially disastrous. Now Google will receive all your spam, sent from @yoursite.co.uk – it won’t be long before your domain name and IP are blocked on the global blacklists. A nightmare to clear up. Here’s the solution you have been waiting for. 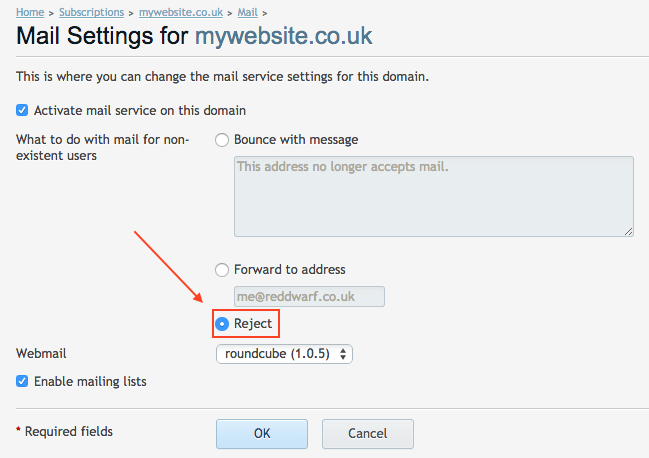 3) Reject method: Using this method, the spam emails are not delivered at all. The connection attempt is rejected at the SMTP server level. No email to deliver, no email to bounce. This is the recommended and best method for dealing with emails sent to non-existent mailboxes – and it’s really easy to do. This will not eliminate all SPAM emails, nor will it guarantee your domain/IP will never be blacklisted, but, it definitely helps. If you do not “Reject” then SPAM and blacklisting is eventually inevitable.